On my laptop (3.06GHz Pentium 4, 1GB RAM) the install take about 3 hours (2 hours for minimal system, and about an hour extra for what Debian considers some useful packages). The minimal install downloads about 66MB, and the additional software is about 42MB on top of that. Wonderful. Now, let's get the images from which we will IPL (IPL stands for Initial Program Load, and it is effectively the "boot" process). 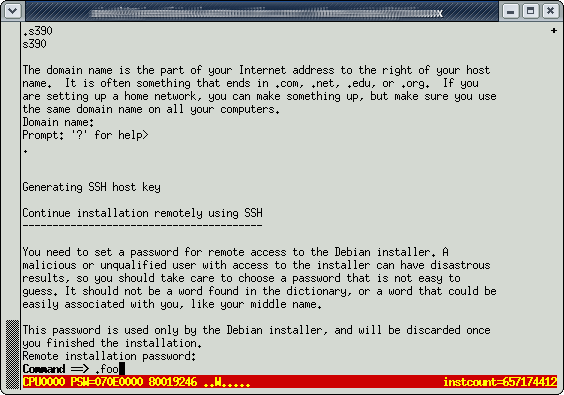 I used Debian 4.0r2 to write this howto, but a newer version should work just as well. Debian 7/s390 does not install - it aborts early on with a segfault in netcfg. 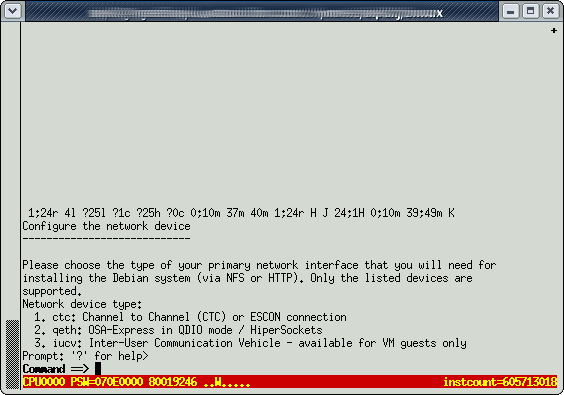 Debian 7/s390x does install, and this is the version you'd want right now anyway. s390 is going away and s390x is backwards compatible. directory. The first two files' names gives away their contents - the first is an initrd, and the second is the kernel image itself. 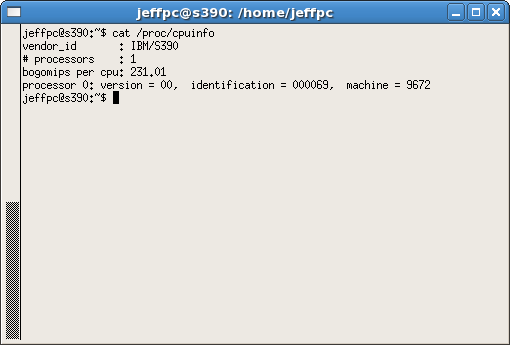 The last file contains the kernel command line options, which on systems like i386, you specify via a keyboard to the bootloader. The top part of the config file specifies the processor features, and the bottom part specifies devices attached. Each device has a device number (leftmost column), a device type (middle column), and optionally arguments (right columns). I'd suggest you read a bit of information from the Hercules website or many other websites dedicated to the IBM System/390 and zSeries architectures. It is just far too much to explain here. One thing to note, if your real hardware has only one core, you may want to change the NUMCPU to 1. 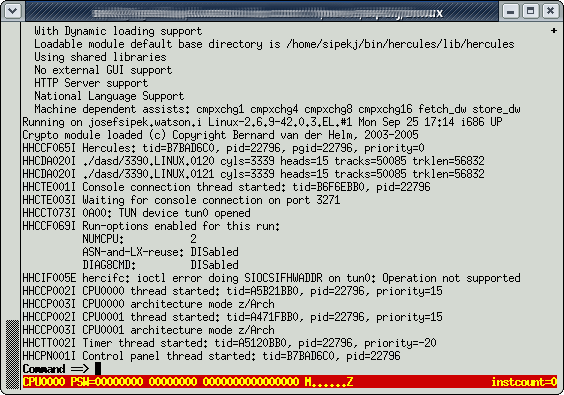 Peter van Dijk reports that NUMCPU=4 causes kernel stalls with Debian 7/s390x. Another thing you may want to change is the last line, which defines a Channel To Channel (CTC, see internet for description of what Channels are) device which will be used as a network bridge to allow the virtual machine access to the LAN and therefore the internet. The first IP address is the address that the virtual machine running s/390 linux will use, and the second address is one which will be used by the real hardware. This means, that the real box will have two IP addresses. Go ahead, and use any valid addresses in the non-routable range 10.0.0.0/8 or 192.168.0.0/16 (this is not a networking guide, so go to the net if you need help with it). Once we start the emulator, it will set up a tun/tap device on the real box which will be connected to the ctc device within S/390. Next step is to generate the DASD devices. DASD stands for Direct Access Storage Device, and it is the S/390 name for very beefed up versions of "disks". For details on how DASD works, see the internet. We defined two so called packs. The first, device number 120, will contain the root file system, and the second, device 121, will contain your home directory. Execute the following two commands in the dasd directory. Each will create a file about 2.7GB in size. If you prefer a single /, leave out the second command (and the related line in s390.conf). You can add another argument to specify the size. 8000 will give you around 6.4 GB. It is safe to ignore the "tun0: Operation not supported" message. If for more information about the networking, look at any number of the networking guides on the internet. which happens to be the card reader! Note, that the dot is important. Without the dot, anything you type will be interpreted by Hercules (the emulator). The dot tells Hercules to send the remainder of the string to the emulated system. 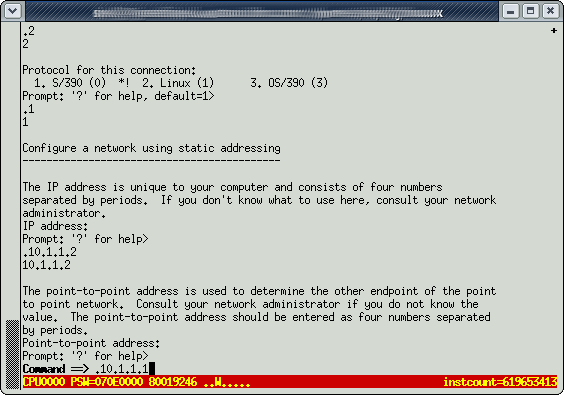 Now, enter the IP addresses for the end-points (must match the IP addresses in the .cnf file). Alright! Now, just sit back, and wait until your system generates a SSH key. This will take a few minutes. you'll know you are on the right track! 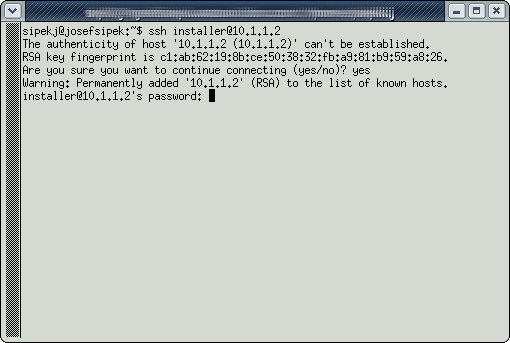 Now, open a new terminal, and ssh into installer@10.1.1.2, if everything you did was right, ssh will ask you for a password. Remember that you are using ssh which encrypts everything, and therefore things will be slow. Select your country and a suitable mirror. Leave the proxy information blank unless you have some special proxy setup. 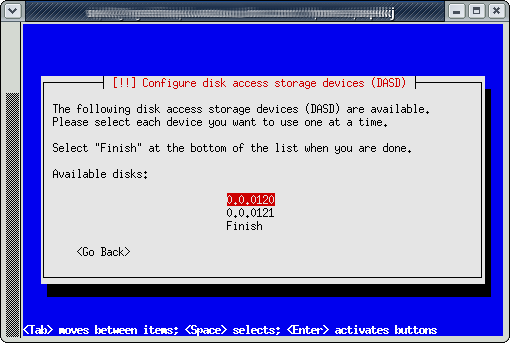 DASD is "Direct Access Storage Device" - yes Debian calls it "Disk access storage device" oh well, they are wrong. You'll see two DASD packs, 0.0.0120 and 0.0.0121. The first will be used for the system root and the second for your /home. 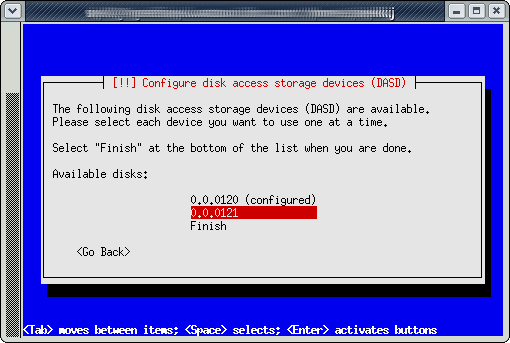 Once both volumes are configured, select "Finish". should seem familiar to anyone who installed Debian before and chose manual partitioning. 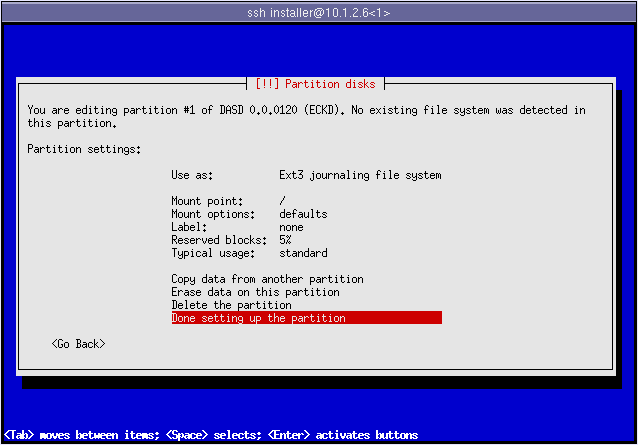 You want to create one partition on each DASD. For filesystem type, feel free to chose whatever filesystem you prefer. Each has their advantages. 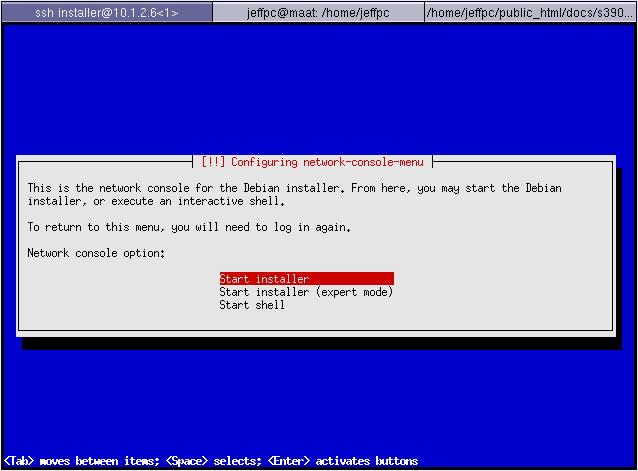 I tend to go with XFS, but because there is a bug in the Debian installer, it is not very easy to get XFS going...so for the sake of simplicity, I went with ext3. 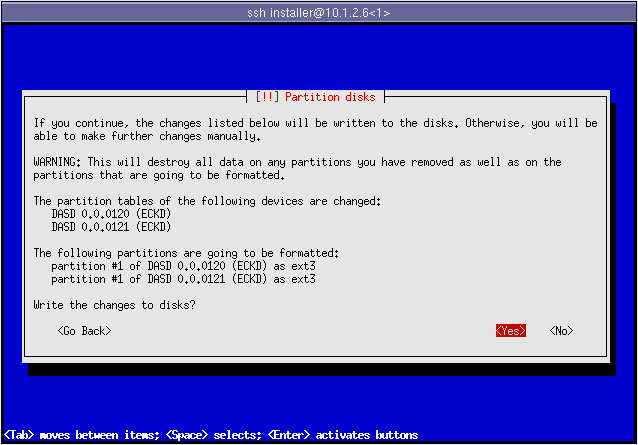 Now, the installer will ask you if you want to go back to the partitioning menu because you didn't define any swap. It's up to you, I tend to go without swap. Now the ext3 filesystems will get created on the DASD packs. The next few questions have to do with locale (country & timezone), so just answer them to the best of your ability. 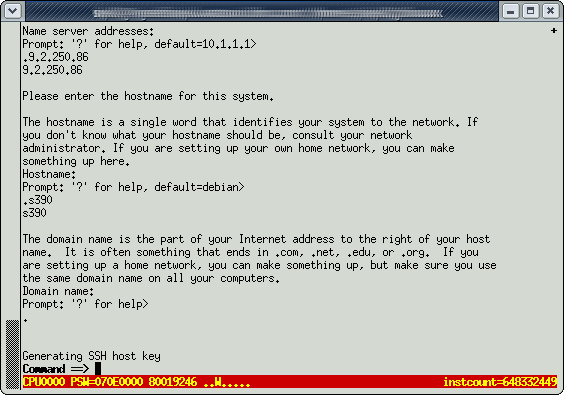 When Linux starts up, you should be able to SSH in without any problems. This will install the right image, and set up zIPL (the bootloader) to do the right thing. The original kernel image will remain installed, and you can select it in the bootloader (right after you issue ipl on the Hercules console). 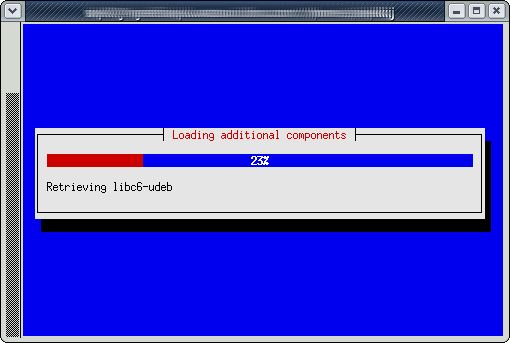 This step appears to be unnecessary on Debian 6 or up, even when installing from s390. YMMV. I hope this HOWTO helped you get started with a mainframe of your own. I tried to be as accurate and specific with the details where I thought it was necessary - the S/390 specific parts. If you have any suggestions, or comments (content, spelling, etc.) feel free to contact me via email: jeffpc@josefsipek.net.